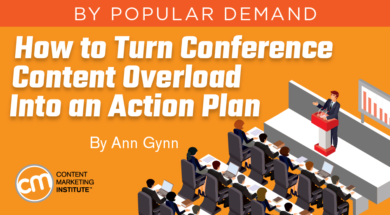 Editor’s note: Given that thousands of marketers succumb to conference overload every year, we thought it was the perfect time to bring back and update last year’s advice on how to overcome it. It’s the day after an invigorating conference. Your head has been filled with trends, slide decks, tips, graphics, and inspiring stories. Your notebook is filled with ideas, notes, and doodles of possibilities for your content marketing program. You’re suffering from a case of the conference overload. But you don’t need to. Take the advice of some past and current Content Marketing World presenters on what to do before, during, and after a conference to take actionable steps for you and your brand without the suffering. Block off one hour the week you return to think strategically. Get out of the weeds and reflect on the things that will make the biggest impact in your life, career, content, and work. Schedule another hour on your calendar a month or two later to review your notes or even re-watch favorite sessions to be reminded of the things you wanted to accomplish on your return. Develop a simple template with no more than 10 empty fields. Print the template (yes, print it). Each day of the conference fill the fields of your template with specific actions. Writing down actions in this template is like a contract with yourself and you’ll commit to following through on them. The things you write down should be one-item actions – not projects or ideas containing several tasks. After your return to the office, go through the list and decide which action to complete that day, next week, or next month. And then go and do it. Don’t overcomplicate what you learned. A month or two later, approach your team and ask: “What of this do we want to commit to doing, and how do we do it over the next half year or year?” That way, compelling and innovative ideas you gather don’t sit unused in a file somewhere. With any session, it’s important to write down one thing – just one thing – to act on. If you act on nothing else from that session, what one thing would move the needle the most in your business? Start with those ideas and then select one to three actions from the entire conference. Set one- or three-month reminders on your calendar to check in on the progress of your action items. At the conference, make a list of resources and ideas that intrigue you or relate to your work. When you get back to the office, review the list. Do any of them make you think you need to change direction on your current work? Explore those first. Later, come back to the list and pick out others that still seem relevant, and schedule time to explore those. Use the conference hashtag to tweet your notes and retweet highlights from others. Each evening at the conference, look through your collection and find themes you’ll want to revisit. Back in the office, use tools such as Wakelet or Adobe Spark to build a collection from the conference and share it with coworkers. Some of the best insights may come from the questions they ask or thoughts they add beyond what was shared at the conference. Make sure the learning turns into action – or at least experimentation – back in the real world. Don’t feel like you have to go to every session. If you find yourself with a time slot where nothing seems to fit, take that hour and write down your thoughts on how you might apply what you’ve learned to a project you’re working on or how you might present the same topic to your coworkers when you get back. Conferences pack a lot of information into a short time and if you wait until you get back to start unpacking some of that, you’ll lose a lot. Make sure your priority post-conference action is based on resolving a problem or achieving a goal clearly understood within the company. If stakeholders believe doing business as usual will get them where they want to go, marketers are unlikely to win support for the new idea. That’s why it’s vital to start small and invest in changes that will make a significant difference. Whatever form your notes take, open them up when you’re back in the office – back in the context of your own work climate. Think about how you could implement the ideas you found interesting. Don’t just make decisions in a vacuum though – share the ideas with trusted colleagues and co-innovators to get their takes. You might be surprised at how the thread of an idea turns into a beautiful quilt. Create a central folder to keep notes, contact names, business cards, printed materials, etc. Make a list of all the follow-up actions to take and prioritize them. Within two weeks, email new people you met – just to tell them it was nice to meet them and to thank them for their time. A few months later, revisit the folder and the list to see if you followed up on everything you wanted to, and to see if you find any new inspiration. Put your notes from the conference in a sharable file so everybody is on the same page. Do a lunch-and-learn in your office to share what you learned. Share everything. Write a blog (or two, or three) for your company intranet to share the knowledge bonanza with your teams. Then in a month or so, do a team presentation focusing on one key innovation or knowledge takeaway from the conference. Draft the “7 Things I Learned” memo on the plane ride back. Send it the next day to a collection of peers internally as a simple, immediate knowledge-sharing practice. Bold headlines and short descriptions. You can add a few “immediate opportunities” bullets that may lead to follow-up. Budget two hours to rewrite your notes. Document everything you learned. Do this within a few days. Distill it into a one-hour presentation for your office. If you don’t have an office, find (or create) a small local group to present to. Committing to teaching creates a pressure that forces you to go deeper into the topics. You’ll internalize the insights and become more of an expert. Determine the people whose presentations resonated the most and start following them on social and reading their updates on a regular basis. Connecting with other attendees and presenters is a great way to keep the energy and resources flowing long after the event. These connections can be the best resource. As you get to know other attendees and speakers personally, you can reach out for help, feedback and more as the content world continually changes. Pull out items from your notes that you and your team can implement (1) right away and (2) in the next six to 12 months. What did you pick up at the conference that you can add to your workflows without a proposal, meeting for approval, or any roadblocks? Break up the longer-term items into smaller goals to work toward each month. For example, if you need to get funding or team buy-in for a six-month item, make that your to-do for month one. Wow – These ideas took off and provided an ROI that would keep you coming back to the event. Meh – These ideas never took off. It’s important to analyze why. This sort of intel can help a lot in making future decisions. Determine which three items you learned that can have the most impact on your career and/or company. Find a buddy to be accountable to and pursue those three items as initiatives. Write them on sticky notes and post them where you see them each day. Ask your buddy to check in with you two months later to ask how those three initiatives are going. Blindly following all that advice just leads to average, commodity work. In the end, conferences, blogs, podcasts, etc., provide the ingredients. You must combine them with other stuff in your kitchen – your situation, team, customers, beliefs, abilities, past experiences – in order to cook a great dish. What’s your cure for turning conference content overload into tasty meals (or snacks) for your content marketing program? Please share in the comments. You’ll never get the case of the conference content overload (or the chance to make actionable differences at your company) if you don’t attend. Register today and use BLOG100 code to save $100. Ann Gynn edits the CMI blog. She also serves as the Tech Tools editor for Chief Content Officer magazine. Ann regularly combines words and strategy for B2B, B2C, and nonprofits, continuing to live up to her high school nickname, Editor Ann. Former college adjunct faculty, Ann also helps train professionals in content so they can do it themselves. Follow Ann on Twitter @anngynn or connect on LinkedIn.